Strange for a lawyer to say that isn’t it? I love them because no matter how many I see there are always problems with them, not necessarily by the form itself but by the way people complete them (or sometimes don’t complete them). And in my world, problems equals profits. The most innocuous of issues can lead to big expense as a recent example examined by the Supreme Court in South Australia demonstrates. 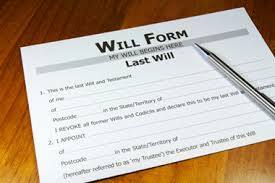 The will kit appointed the wife and one son as an executor and then the pre-printed section of the form continued…. “…but if he/she/they does not/do not outlive me or is/are unwilling to act or incapable of acting then I appoint….” and another son was named. The wife pre-deceased the will writer and as such the question which was referred to the Supreme Court Judge was whether the first son was only appointed executor if the wife had survived or whether, as the case was, the 2 sons would act jointly as executors. It was quite likely that the 2 sons did not care who acted as executor, if either or both acted, or neither, as long as the estate could be administered with the least amount of fuss, delay and of course, expense. The Probate Registry do not see things that way at all. So off they went to the Supreme Court to get an order as to who should act as executor. Turns out the Judge found that both sons would act as executors as other sections of the pre-printed and completed will kit indicated that a joint appointment was intended. I’ve said it before and I will say it again, I love will kits. You stuff them up, I get to fix them! Despite that…….avoid a cheap will kit and have your will professionally prepared by an experienced solicitor, there’s just too much at stake.